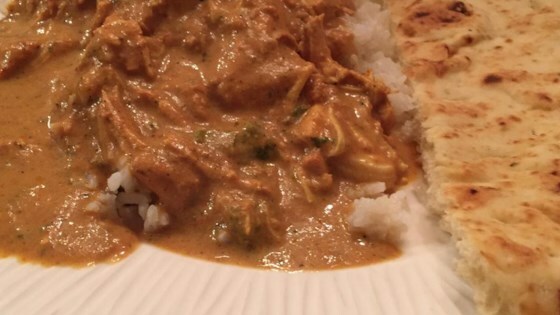 "This is a very quick, easy, and tasty version of the national dish of the UK! Try it once and you'll make it time and again. Serve over basmati rice." Stir chicken, tomato sauce, yogurt, jalapeno pepper, ginger, cumin, garam masala, black pepper, paprika, garlic, cinnamon, coriander, and salt together in a slow cooker. Cook on Low for 6 to 8 hours. Stir cream, cilantro, and lemon juice into chicken mixture during the last 30 minutes of cooking. Substituted a can of coconut milk for the yogurt. Cooked for three hours on low on the stove, outstanding –! Super delicious. Was even better 2 days after. I cooked it w/ diced chicken thighs for 2.5 hours on high and used half and half and light plain yogurt and it was so good. Add 1/2 tsp of cayenne and 2 tbl turmeric and it's perfect!